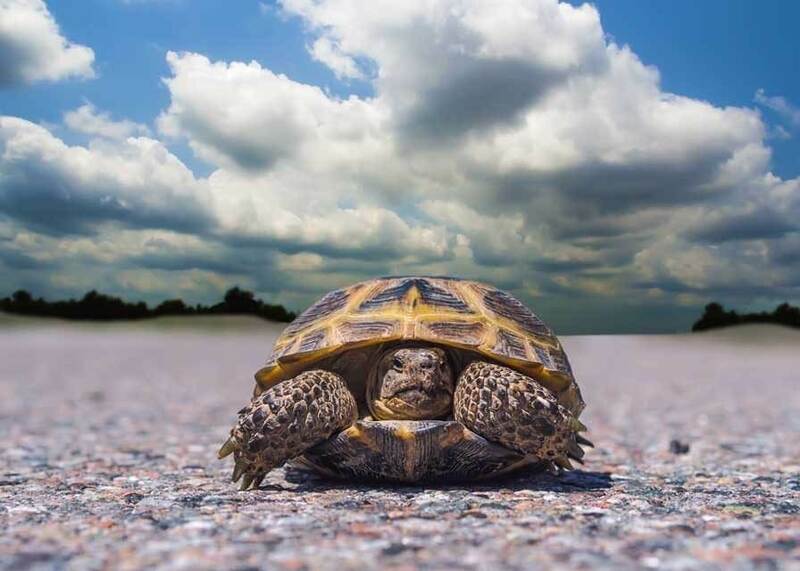 Once you have decided that yes, a box turtle is the absolutely perfect pet for you, and perhaps you even already have your eye on a box turtle at a local store or breeder’s facility, the next step will be to get ready to bring your new pet home. This is the beginning of your journey to learn how to take care of a turtle. turtles are not tortoises. Despite their distinctly tortoise-like looks, box turtles are not actually tortoises at all. It is simple to imagine how the confusion first began. 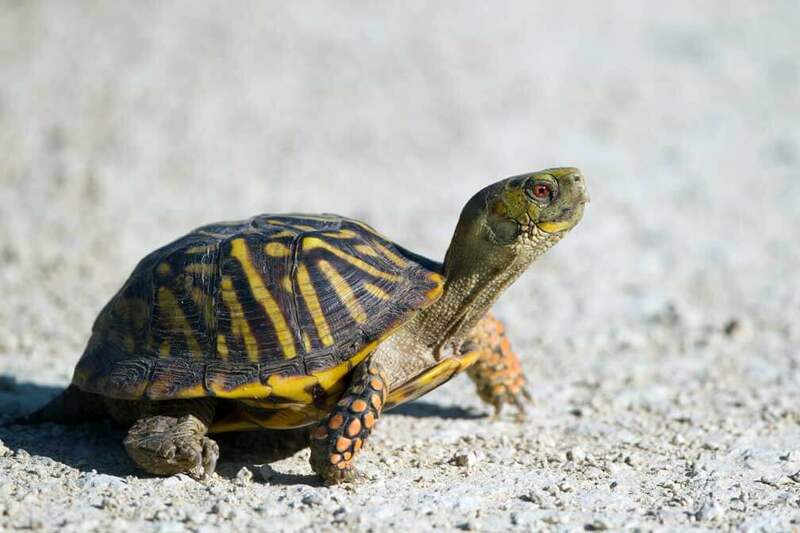 Take a quick look at any box turtle, and you will see a reptile with a high, domed shell, sturdy thick-skinned clawed feet and a largely land-based habitat….in short, a tortoise. Like all shelled reptiles, box turtles do belong to the order Chelonii. But their genus, Terrapene, gives a hint to their true identity as land-loving members of the family Emydidae. Emydidae loosely translates to mean “American pond turtle.” So this tells us that box turtles spend most of their time on land but have a greater affinity for water (and a slightly improved ability to swim) than a tortoise would. 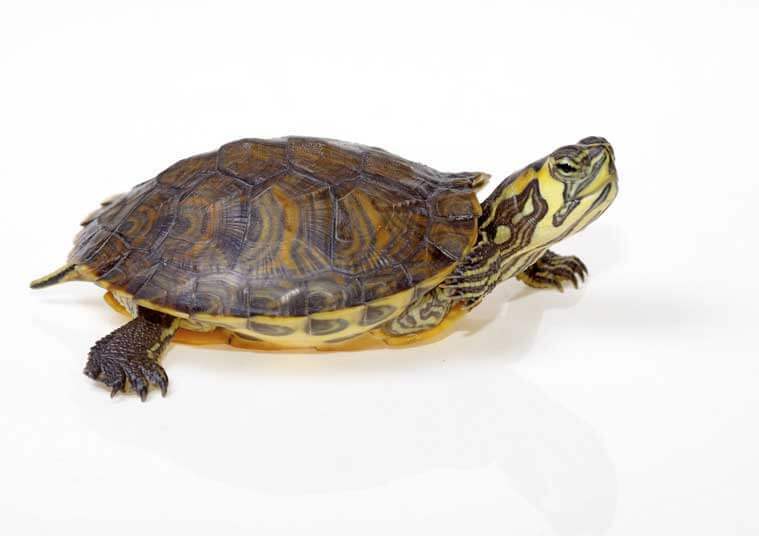 In fact, they actually have more in common, genetically speaking, with the aquatic red-eared slider (another popular pet choice) than with tortoises! box turtle species and sub-species share similar features, if not coloration. 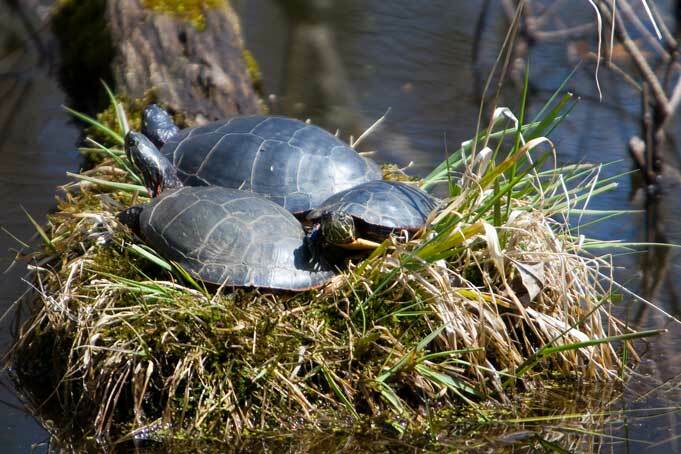 For example, box turtles by definition all possess a boxy high domed shell with inner muscular hinges. Their shells have an oval-to-nearly-round shape when viewed aerially. Box turtles possess strong legs with clawed feet and a varying number of toes depending on sub-species.Their head, neck and jaw is also quite powerful, which is important as box turtles in the wild feed largely on protein sources such as fish and insects, although they will also eat greens and fallen fruits. Box turtles in the wild are also fond of fungi, including those mushroom species that are toxic to humans. For this reason, box turtles bear less risk of predation by human hunters, on account of how eating one can make you very sick! Common box turtle: Eastern, Florida, 3-toed, Gulf Coast, Yucatan, Mexican, Terrapene carolina putnami (now extinct). Western (Ornate) box turtle: Ornate, Desert. Spotted box turtle: Northern spotted, Southern spotted. Besure your new pet box turtle is healthy. 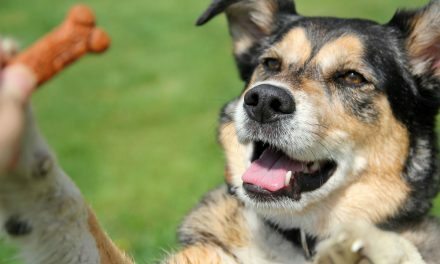 First things first – before you go about spending the time and cash to get everything ready, you want to make sure your new pet is HEALTHY. This means, if at all possible, making a visit to the breeder’s actual facility (obviously, this won’t be possible if your new turtle is at a pet store or is a rescue) to see the operation in person. 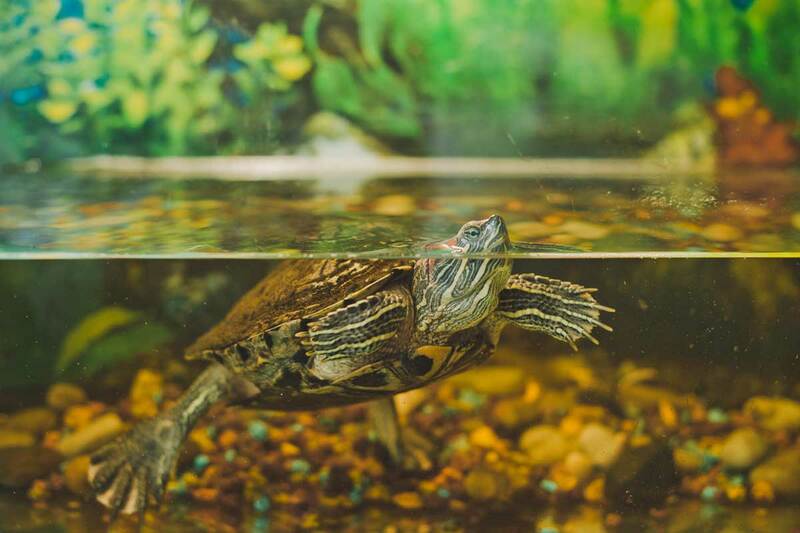 When you visit, you are looking for a clean facility, healthy-looking adult box turtles, spacious living quarters, good food and plenty of water and a professional approach to breeding pet turtles that makes itself readily known. There is simply no substitute for being able to see where your baby turtle was born (or rescued) with your own eyes. You also want to know in advance what guarantees you have if your new turtle gets sick right away. At minimum, the pet store or breeder should give you a 30-day guarantee of health. 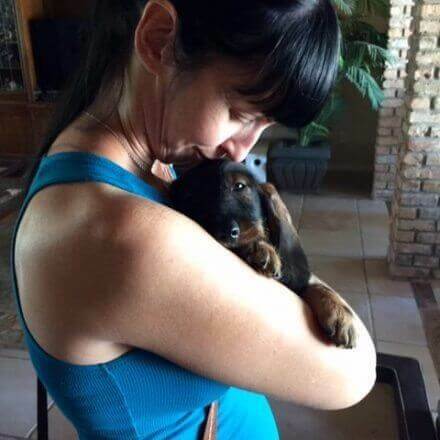 For rescues there may be no formal guarantees. So first, you will want to rush your new box turtle right to the vet for a full health check-up. If minor health issues are found, you can then choose whether to treat them and keep your pet turtle or return it for a refund. NOTE: This initial period is particularly critical because keeping an already healthy turtle healthy will be much less stressful, time-consuming and expensive for you both than rehabilitating a newly acquired sick turtle back to health while you also learn the ropes of turtle care. Make sure your new set-up is conducive to your pet turtle’s continued health. If you are bringing home a baby turtle, your only housing option is INSIDE. If you are bringing home an adult turtle, and especially a rescue, you will want to try to match the type of turtle tank housing your turtle had in its last home as closely as possible. For your indoor enclosure, do NOT use a fish aquarium or any clear-glass enclosure. Your box turtle will be able to see out the glass and thus will try to escape continuously, which will cause unnecessary stress for your new pet in what is an already stressful situation. Rather, choose an opaque tub or turtle tank that your new turtle cannot see through. For a baby turtle, a turtle tank with lower walls will make it easier to keep temperature and humidity regulated (but you will need higher walls for an adult). A shoebox-sized turtle tank will be perfectly adequate for a hatchling. For an adult, a 40-gallon enclosure is the minimum recommended size. We like this quality wood house. For any outdoor play area or enclosure, you will need to ensure it is completely predator-proof before allowing your turtle to spend time in it. This will mean digging down beneath the surface to install barriers against tunneling rats, mice and snakes and covering over the top with chicken wire or a similar deterrent to ward off flying or climbing predators. Your enclosure walls must also be thick enough to resist chewing or tearing. And you must provide a warm and cool area with the same basic specifications as detailed in “Lighting & Temperature” and “Humidity” here. At a minimum, depending on what your local climate is like, you will need to install at least a 75 or 100 watt full spectrum UV-B bulb (critical to aid in calcium absorption for shell growth) and possibly also a ceramic heat bulb for extra heat at night in your turtle tank. You will need to make sure the lamp dome holders are rated for the strength of bulbs you select. Placement is also essential – be SURE your lamp bulbs and holders are not anywhere near anything that might be potentially flammable, and use great caution when handling them yourself. While you can use a properly rated under-enclosure heat pad (of the kind sold in pet stores for specifically this purpose) to add heat to your turtle tank at night and during the colder times, do not EVER use a heat rock – your turtle could sustain serious burns!! Your temperature range goal for a baby turtle or juvenile should be no lower than 75 degrees Fahrenheit at the cool end of the enclosure and no higher than 90 at the warm end, with a 95 degree basking spot somewhere on the warm end and an ambient heat range of 80 degrees Fahrenheit. For an adult box turtle, your turtle is better able to tolerate cooler temperatures, but nothing lower than down to 60 degrees Fahrenheit. And here again, providing an ambient overall temperature in the turtle tank of 80 degrees Fahrenheit with the warm end at around 90 and a 95 degree basking spot is your goal. Using a timer can help in providing the 8 to 12 hour cycles of daylight/night that your turtle would get in the wild. Be sure to follow your area’s day/light cycles as closely as you can when setting your turtle’s timer to ensure it is dark in your turtle tank when it is night outside and light when it is day outside. Even if you live in a very humid climate, part of learning how to take care of a turtle includes realizing that the use of air conditioning indoors will take most of the humidity out of your indoor air. So you will need to add that back into your box turtle’s turtle tank. You can do this with the addition of humidifiers and/or misters or a simple spray bottle used several times per day. Your goal for a baby turtle or juvenile should be a 60 to 70 percent humidity range. 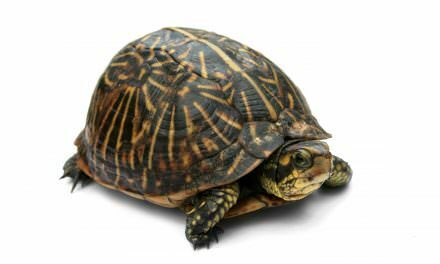 An adult box turtle can tolerate lower humidity better than a juvenile but your goal should still be 60 percent or higher. You will need to experiment with your humidifier(s) and/or spray misters to figure out what maintains a consistent humidity level in the required range. Selecting a programmable humidifier to use inside your turtle tank may also help with this. The best way to monitor humidity and temperature is to get a combination thermometer/hygrometer and a temperature gun. These two tools will be invaluable in spot-checking your box turtle’s enclosure from every area to be sure the basking/warm/cool and humidity ranges are adequate to your pet’s needs. With only one exception, box pet turtles are predominantly land-dwellers. They may enjoy a little dip or even a brief swim, but will be back on land soon enough. So the water dish you provide inside the turtle tank should be in a hygienic, easy-to-clean ceramic or fired pottery dish that is shallow – this is critical for hatchlings in particular. If the water level goes up past the very bottom of your turtle’s under-shell (plastron) it is too deep! In the wild, turtles often seek out water to eliminate their wastes as well as to drink, bathe and soak. So you should clean the water dish and change the water frequently and as often as daily as needed. As well, if your local water is heavily chlorinated, you will need to provide filtered water (water that has the chlorine and heavy metals removed). One option is to purchase de-chlorinator tablets or drops at your local pet store or online. Another option is to use filtered drinking or spring water instead. Whatever you do decide, just be sure not to use distilled water, which can be dangerous for your turtle since all minerals (some of which your turtle needs for health reasons) have been removed from the water. Box turtles in general are protein-centric – hatchlings more so than adults. In the wild, your box turtle would be gobbling up LIVE worms, bugs, snails, beetles, crickets and (as an adult) even small carrion prey! In captivity, you will need to provide a balanced diet that mimics as best you can the wild forage your turtle would naturally seek out. This includes some live food if at all possible – your turtle will derive much enrichment from “hunting” it! Protein- You can supplement live food (crickets, worms, fish, snails, slugs) with puppy chow, hard-boiled eggs, canned tuna or salmon, freeze-dried mealworms and other worms. You should be able to find a ready supply of live and freeze-dried options for pet turtles at your local pet store or by mail order. Greens- Dandelion greens, mustard greens, collard greens and other dark leafy greens (although not spinach, which leeches calcium) can all supplement the protein. Fruits- Berries, melon, kiwi, figs and apples are all good choices. Fungi- Mushrooms such as the kind you can buy at the local grocery store are a good supplement to your turtle’s diet as well. Commercial foods- You can also supplement with commercial box turtle foods as needed, but for health reasons, it is best not to base your turtle’s diet on these but to use them as occasional treats instead. 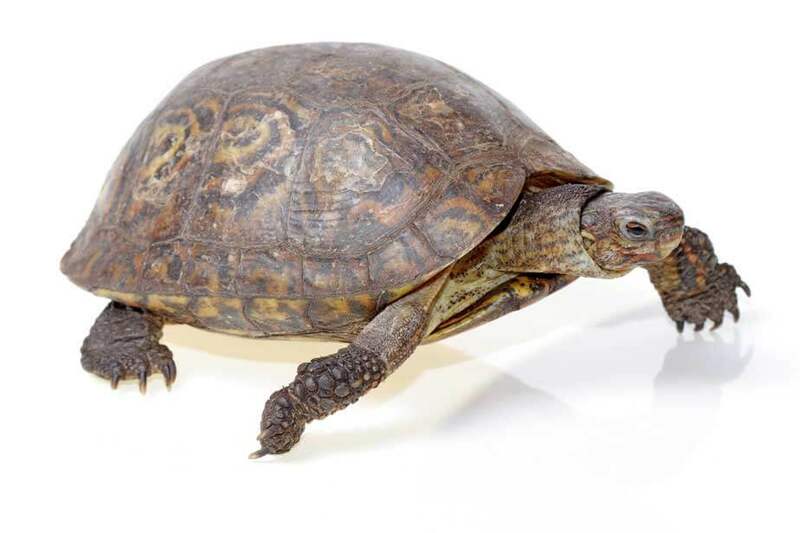 Vitamin supplement- Be sure to dust foods with a vet-recommended box turtle vitamin supplement to ensure your turtle is getting sufficient calcium and nutrients to grow and maintain a strong shell. Be sure supplementation includes calcium with D-3 but WITHOUT phosphorus added. Calcium block- You will need to offer your box turtle a calcium block, which serves both as an extra source of calcium and a way to keep your turtle’s beak trimmed. Wash greens and fruits thoroughly in case they have been exposed to pesticides or herbicides. Do not feed your pet turtle live wild insects (and especially not lightning bugs, which are poisonous) or fungi since these items may have come in contact with toxins, pesticides or poisons. For a hatchling or juvenile box turtle, you may need to steam hard foods like carrots or zucchini or chop/dice foods like apples into portions suitable for consumption by smaller baby turtle jaws. Offer the food on a flat, natural rock surface to help your turtle keep its beak trimmed. You should provide a private feeding spot in the cooler part of the turtle tank. Be sure to offer food daily, especially for hatchlings and juveniles. Offer the food for at least 30 minutes and then remove what is not eaten after that time to prevent spoilage. 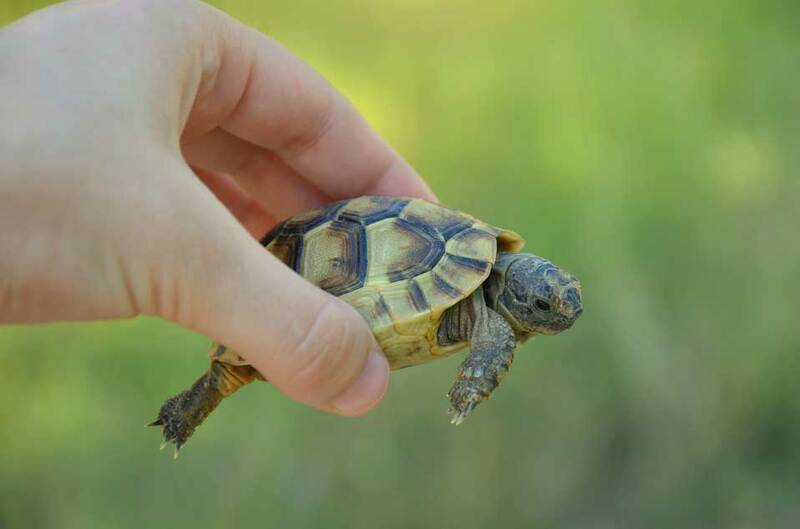 As you learn to take care of a turtle, be sure to watch hatchlings and juveniles as closely as you can to make sure your portion sizes are not too large or cumbersome for their little jaws to manage. Because your box turtle is primarily a land-dweller but also has high humidity needs, you should offer a nice long soak at least once per week for adults and 2 to 3 times per week for hatchlings and juveniles. Aim for a water temperature of 70 degrees for comfort. Never leave your pet turtle unsupervised during soaks in case of drowning! Soaking can also be a great aid and comfort when your turtle’s shell is shedding its outermost layer (which some species of box turtles will do more than others) and also when your turtle needs to poop (water eases constipation). In addition to the basics – substrate, lighting, water bowl, food dish – you will want to add some décor that turns the enclosure into a comfy turtle tank. Plastic plants can offer a great hygienic option for providing both camouflage and visual variety. Protected hiding places, such as a rock cave or an up-turned plastic container with a door cut into the side, will be essential for retaining humidity and for meeting your turtle’s need to hide. You can pack one or both hiding spots in your turtle tank with damp moss to create a more humid environment. You may also want to provide a plastic top or strip of Plexiglass to cover a portion of the top of the turtle tank – this will also help in retaining heat and humidity and can provide some extra security for hatchlings. Here, as your baby turtle grows, you will likely need to enclose the whole top of the turtle tank with chicken wire as well to guard against escape. Your turtle will become more active as it gets older and bigger, so you can add in some flat rocks along with the substrate inside the turtle tank. 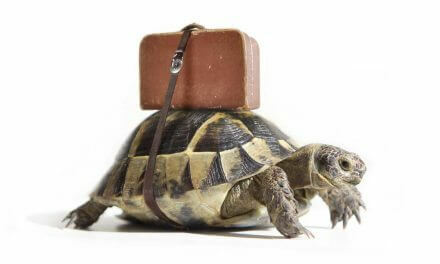 Rocks are great for keeping your pet turtle’s nails trimmed as well as to offer a more challenging terrain. You can change up the décor a bit when you clean the turtle tank for some enrichment and variety. But always make sure you are offering the warm and cool ends and that the temperature and humidity levels are staying consistent to keep your turtle’s immune system strong. 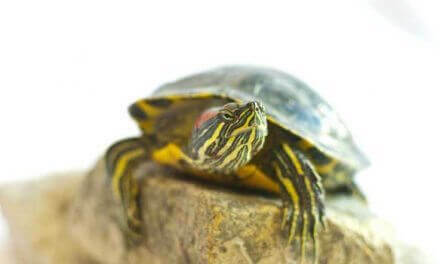 Your pet turtle will rely on you to keep the turtle tank and habitat decor clean and sanitary. In addition to changing the water daily, removing food to avoid spoilage, and removing any obviously soiled moss or substrate as needed, you will want to schedule regular full cleanings. In fact, this is one of the most important parts of learning to take care of a turtle! Be sure to use a non-toxic cleaning solution, such as a few drops of vinegar in water or a very mild Castille soap diluted with water (Dr. Bronner’s works great here). You can soak the plastic plants in the solution while cleaning the habitat itself. You may want to boil any rocks to remove pests or bacteria. Be sure you wash everything in the turtle tank very thoroughly to remove all traces of cleaning solutions before putting your turtle back in its home. So long as you do a good job of daily maintenance, you shouldn’t need to do a full turtle tank cleaning more than once every 1 to 2 months or so (perhaps more frequently as your turtle gets older).